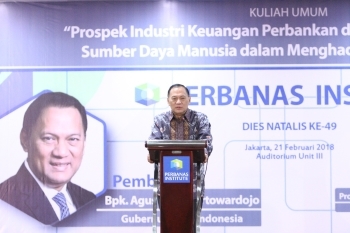 On 21st February 2018, Perbanas Institute hosted a public lecture by the Governor of Bank Indonesia Mr Agus DW Martowardojo at its campus in Jakarta. Titled ‘Challenges in the Preparation of Human Resources for the Banking and Financial Industries in Facing the Digital Economy’, the topic focused on how banks and financial institutions must utilise the latest technologies in their operations, and in doing so, have to also simultaneously improve the digital proficiencies of their human resources in order to deliver solutions that meet customer demands for online banking. The lecture was moderated by Perbanas’s Prof Dr Haryono Umar and was attended by the leaders of banking associations from across the country in addition to faculty members and students. Coinciding with the institute’s 49th anniversary, Mr Martowardojo elaborated that through successfully developing a skilled workforce coupled with the incorporation of digital technology, financial institutions can create innovative banking products and services that focus on a customer-centred business strategy, combining personalisation and speed to allow customers to easily understand banking processes; this includes aspects such as applying and getting approval for a loan or ways to fully utilise a bank account. Furthermore, digital capabilities can be used to analyse important data in areas from product design and pricing to underwriting, and therefore improve the overall value chain of the organisation. In hosting this public lecture, Perbanas Institute demonstrated its ability to long anticipate the advancement of technology in the banking industry, exemplifying its nuanced understanding of local and international trends. Such efforts have resulted in the institute forging a highly-regarded reputation in Asian banking education, and have enabled its graduates to tackle the core issues currently impacting the IT infrastructure of the country’s financial sector.